After a nice stop at the Train Graveyard I went onto the road for 4km or so. I couldnt help but think that the road is a little crooked and all these people must spend hours tilted 5-10 degrees to the side? My initial plan to ride the train tracks west was changed by the howling wind, if I turn more south, i will get one hell of a tailwind and so I did. I pre-loaded a lot of maps while browsing in town so I had some different options. It’s a miracle I made it out today after I took long to pack, eat, visit immigration (to check visa duration) and all…. When I talked to the store owner who had a car he looked at my route and suggested something else, it’s only sand he said. I said good, thats what i want. there was an excellent cover from the wind and a luxurious dinner with potatoes and tomatoes and onion! I even had a can of condensed milk for coffee in the morning. This is one of the three moving vehicles I saw during this entire post, all the way to Chile. The road had very nicely designed signs which made me worry a little, from what I heard for the last section of Bolivia there is a hefty 150BOB ($30CAD) to pass by. After the feeding frenzy in Uyuni, I had 30BOB to my name which was just enough to cover the 1 day visa fine, if for some reason I get delayed. While setting up my tent, a wind gust took out 3 stakes and the tent body and I started running after it. I dont think i’ve ran like this ever, if I didnt catch it it will be gone…. it will reach argentina before me for sure and I’ll have to sleep wrapped in my tent fly somehow for the next little while…. 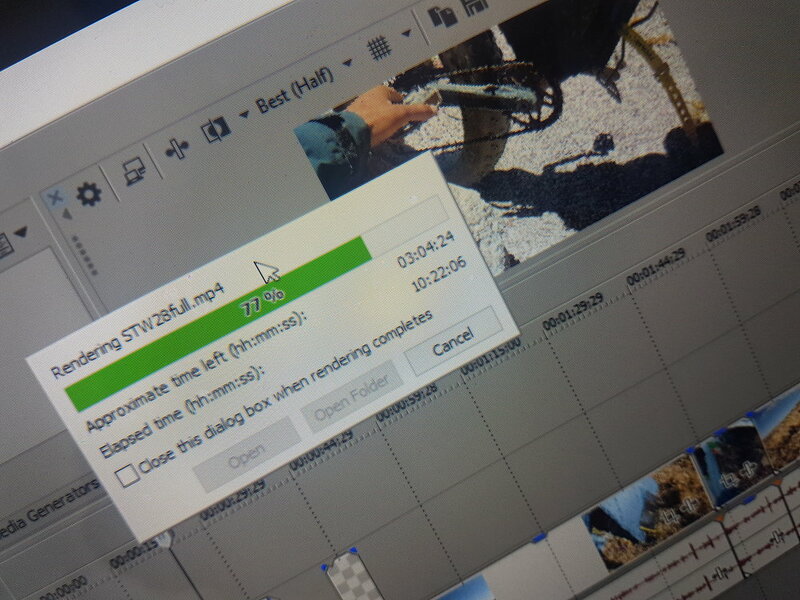 I barely got it, i was out of breath, tired but… well…. I will need to make sure I have something heavy inside next time. I had 3 days left including today and with the bottom bracket I was already concerned I would could damage the crank shaft. 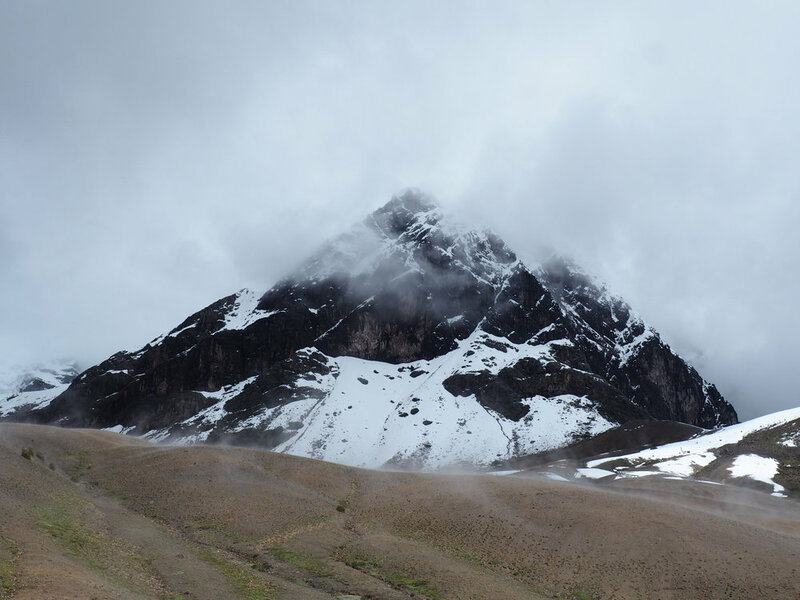 A detour to the highest road in the world (5800m!) was not really an option, epsecially if the winds continue blowing from where i am heading (west-ish). 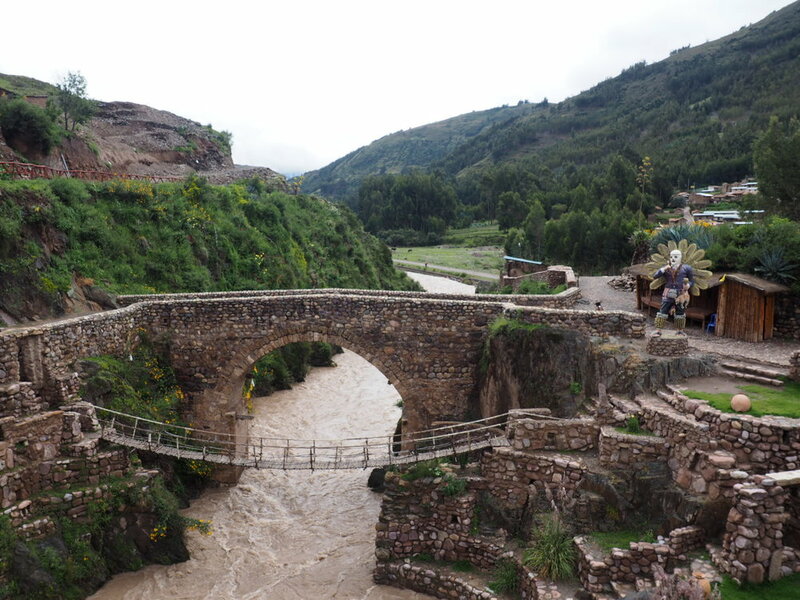 Water was also a worry, as I only saw one stream yesterday in the afternoon and the lakes were likely sulphury or salty or at best just full of flamingo…. um, excretions. somewhere around 1-2pm the wind was just too strong to ride (considering the bottom bracket) and I just walked my bike the rest of the day, even on the downhils. I set up with some okay wind cover for the night. A check of the crank shaft (which in the absence of a proper tool is done by unscrewing the bolt holding the driveside crank and riding until it falls off) showed barely/minor damage so I continued riding it (although trying to put most force on the non-drive side pedal stroke to avoid more damage. After noon there wasnt much riding, only on the downhills. I was getting ready to ration my last liter of water when I spotted a little stream, coming out of nowhere and disappearing into the sand in few kilometers. With the wind increasing it felt really pointless walking in the evening, I found some rock cover and I’d need to leave early in the cold but calm weather tomorrow. That wind is tough, wow. It was about 4500m elevation but it was extremely cold, water bottles inside the tent were frozen solid (note: i’ll need to take better care of the nalgene because it can break!). I wanted to go and take a photo of the frozen flamingos but they have normally flown away when they see me from afar… these shots from planet earth 2 must have been with some super zoom camera! I wondered what kind of an encounter it would have been if this military base was manned, hmmm! at some point I stumbled upon a bike track, I could see the zig-zag, the lane changes, footprints. Ha, its not easy riding here! A standard bike would certainly involve a lot of walking. since noon I was counting my hours and approximate distance, I estimated 5km/h with the wind was a good walking pace and was aiming to be there before 5 in case they close. Now the funny thing is that with this wind, after 4 it becomes very cold. I made it at 5:20 to the border post and got stamped out, I wasn’t asked to take off my hood or anything…. hmm… border guy told me chile immigration is in 5km although both journals I read said it was in San Pedro de Atacama. Chile had pavement but I still walked with the wind, kind of riding slight downhill sections. The immigration building seemed quite fancy but there were no signs, no work hours, nothing. I sat there for 5min drinking my ice cold water and then knocked on both front and back doors. Nothing, it must be in san pedro then. I put on rain pants but was too cold to undo the top (also high chance of breaking the zipper since it was almost gone) and dig my down jacket in my bag to put it on. I just decided to roll on down as far as I can, preferrably under 4000m. Despite the wind the grade along with the pavement were enough to get me rolling downhill at a pretty reasonable but cold pace. At San Pedro I met with a friend of a friend and also received a nice package from USA for the next leg, instant mash potatoes and chilli!!! I made it to the post, already cold and knocked a bunch of time, eventually somebody saw me and they let me in. Boy its so warm in there! They easily stamped me in and asked me how am I going to get back to San Pedro, I said I’ll hitch a ride. 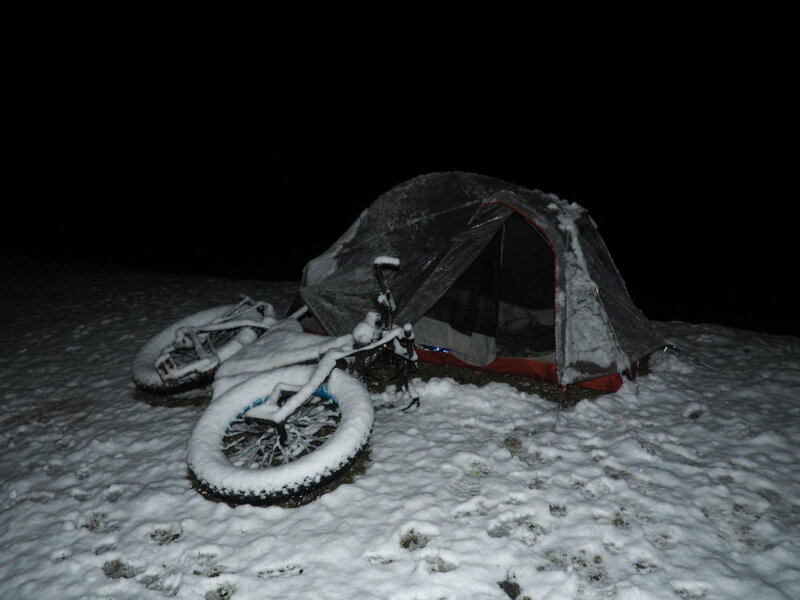 It was about the same time as yesterday when i rode down and I clearly remember few trucks passing down after I set up my tent. They said ok, we’ll find you a ride and everyone from the office came outside with me. haha, if that doesnt make my day i dont know what will! I was just getting worried about them freezing when a pickup drove up and talked to one of them (people from switzerland were just driving up in a rental car to ask some questions), they took me in on the way down and i feel really bad for them for having to be in an enclosed space with me and about two weeks of no laundry (and 7 days without shower). and to top it off right as I made it walking to my friend’s place, the brazillian grill was well underway! along with the happiest dog in the southern hemisphere! 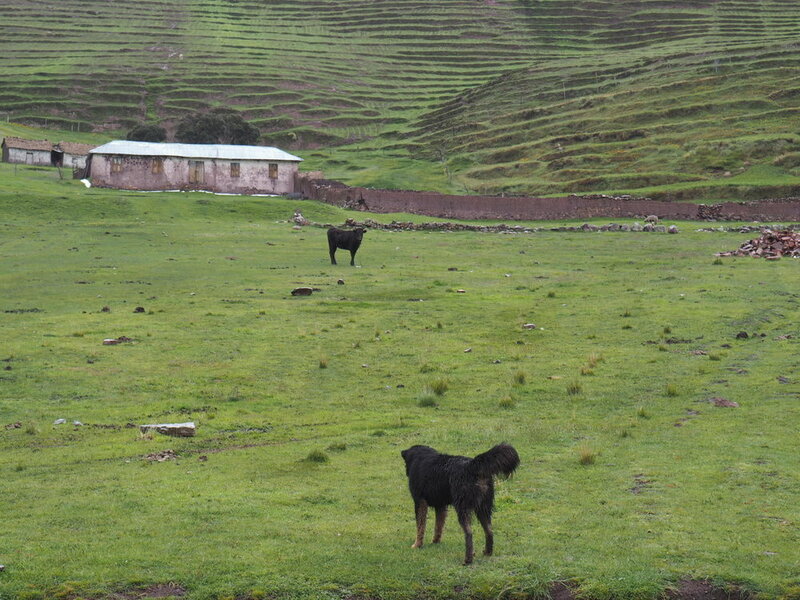 It has been almost 5 months here in Peru and just like any other long stay like that I had the urge to change country, scenery and experience. 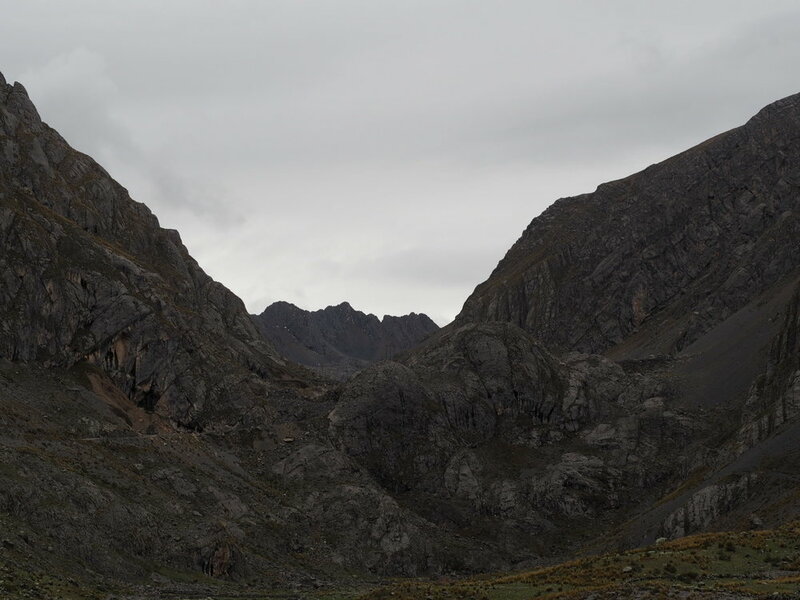 Eventually the constant up and down in the rain can get tedious and all these beautiful mountains and remote mines start blending together into something less exciting and interesting that they normally are. 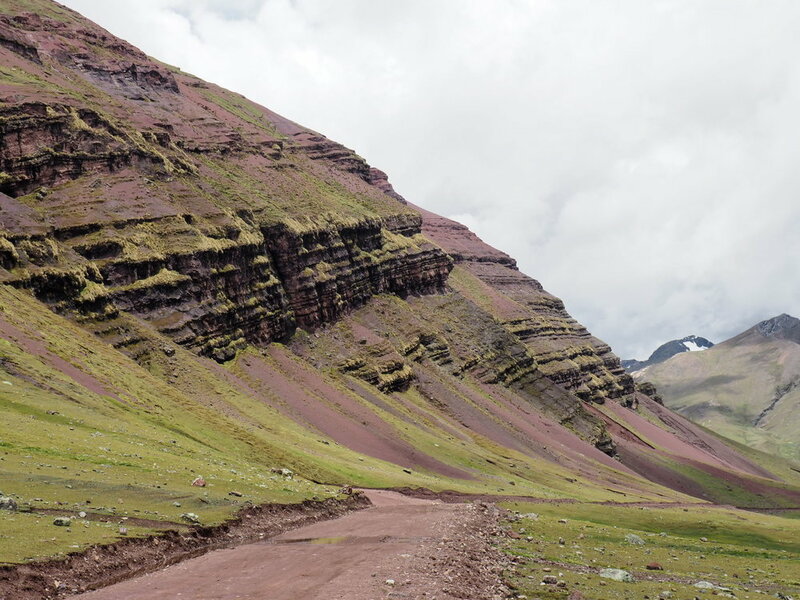 Ausangate, however held promise of not only snowcapped giants and rideable singletrack and it was just the start of another route pioneered by Cass Guilbert and the Dammer brothers (legends of south american bikepacking). 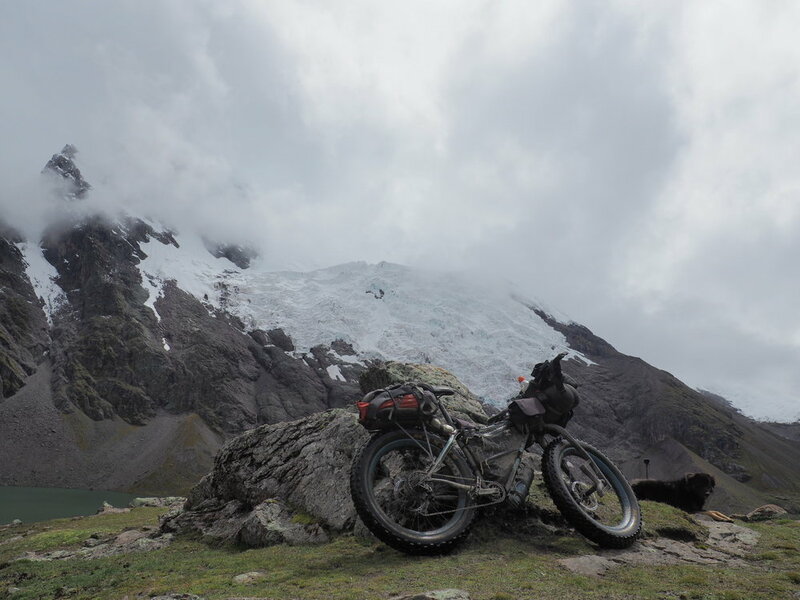 A short ride down the highway and a pleasant climb up a nice valley led toward the Ausangate trek. Only if it wasn't for the looming clouds and impending rain. Was it a mistake going in during the rain season? 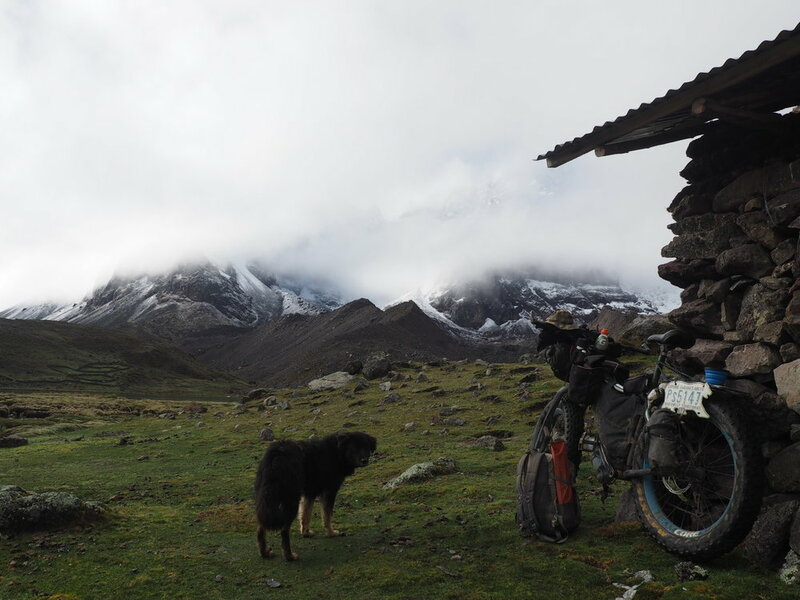 I managed to scrounge a quick lunch from a tourist buffet and when I went out a wet dog was waiting by my bike. We were immidiately friends, it was hard to tell who was wetter or who smelled worse. He took my safety very importantly and made sure that the cows kept their distance. He was not a big fan of water. We made our way to the trail but all there was were few houses and half a bridge over a very strong stream. I carried the bike and the dog over the first part but the main part was just too strong. The roar of the water was demotivating as I scouted up and down with no luck. 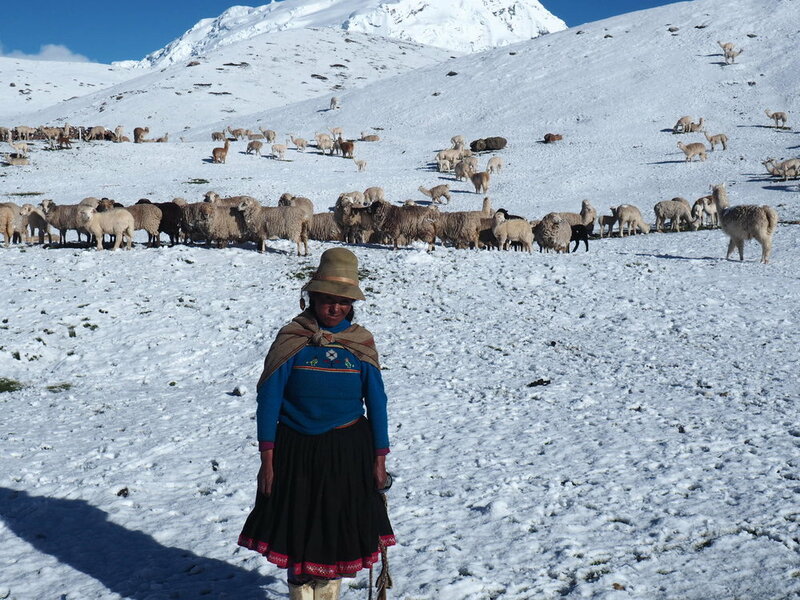 I went to ask a woman at the nearby huts if I can cross but she didnt speak spanish. She talked and talked but it was not spanish. It was late in the day but I needed to find a way across. Open street maps shows a tiny trail heading up adjacent to the river and ending mid way up. Perhaps I can cross further up and free for all it down the mountainside to the trail? I met a man on a horse and asked him if he can take me over the river. He said he had another horse that can cross it but said there are two more bigger rivers further up. He also spoke very basic spanish but on the bright side I learned the Kechua word for river: "Mayo" as he kept repeating it throughout. Or maybe that was the word for "you are an idiot and you should go back"!!! I told him we will talk tomorrow but I wanted to see where this old road up the mountain went maybe to a bridge? A river crossing looming over your nights dreams is not a good idea. But I wasnt alone in this, the wet pooch decided I was worthy of following and I decided he was worthy of getting carried across streams he cant jump over. In the fading light I spoke to a shepherd who told me there was a bridge further up. A bridge!!! Just a kilometer or two in the dark across the pampa and I was far enough from the roaring water. I set up in the rain and me and dog ate decent pasta dinner with sasuage and onion. And the morning revealed a white wonderland. sadly my alarm had no snooze, once shadow realized I was up it was time to run around and bark. him and the other dogs had been doing circles around my tent all night. Shadow was definitely not cold... i tried one time to get him under the fly last night to which his instinct kicked in and thought I was trying to kill him, so he ran away. I spoke with a woman about directions but she didnt speak much spanish. Waving and pointing I think there was a trail over the hill. It was truly a dream ride, the views and the sun. The kind where you keep stopping and hoping it will last forever. Finally a singletrack descend to where the main trail is. And this mountain. I dont know its name but it just looked so good with the fresh snow and the clouds and the sun. While it dodnt rain, the snow melt surely added to this river but it was not all that bad. I crossed few times, one for my backpack and electronics, one for the bike, one for the dog.... and just because it was so much fun, one for the camera! Then it was time to rest. Dog was dry in the sun and pretty cool to pet too. 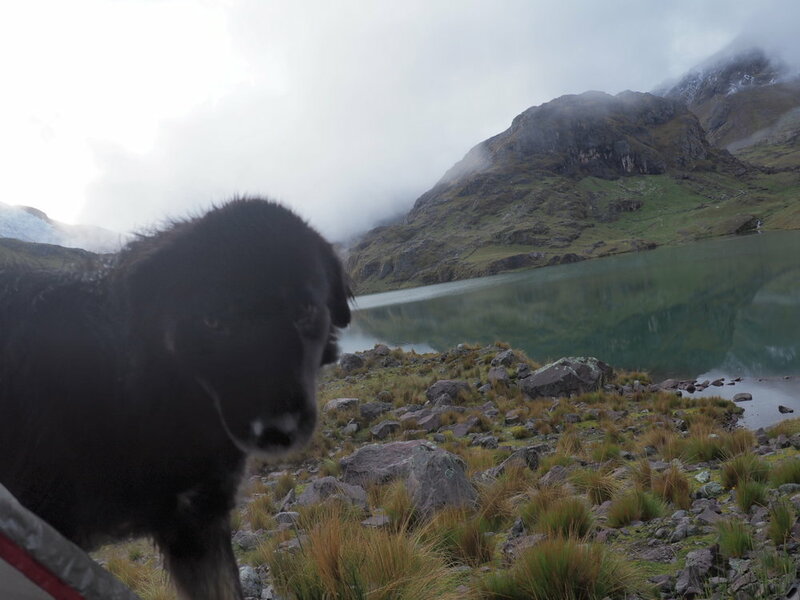 He ran up and down chasing birds and vicuñas, sniffing stuff and sometimes I thought he left but he would reappear just behind me. I called him Shadow, Amigo and My Friend. We normally have 3 names, why cant dogs have 3 names too??? There was even improved trail. I reckoned you can ridge a moto over this pass!!! Well until that river. I kept pushing until late but a rather odd stone house caught my attention across a lake, it was a shelter and best of all clean enough to sleep in there in my tent. Now if you looked earlier at the lady shepherd and she wore sunglasses. I didnt. I didnt wear my sunhat either that day. While it still remains a mystery, I think I was snowblind. I simply couldnt open my eyes and look without excessive tears. I packed up but it was no good. I couldnt travel today. I spent all day in the tent with my eyes closed alternating between coffee, hot chocolate and noodles. Dog didnt like noodles. He liked to be outside, getting wet... probably thinking "human, why dont you come outside??? its nice here!" But also chilled indoors too. 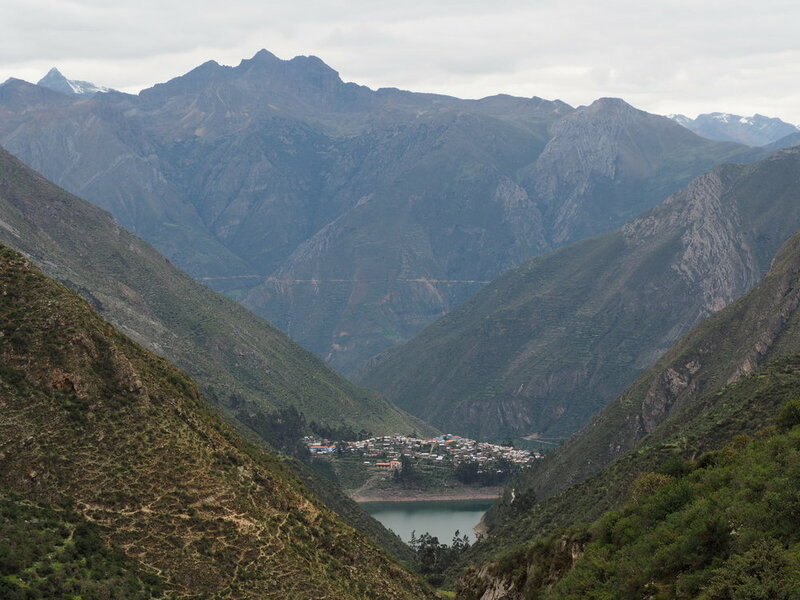 A man showed up to charge me money for being here, as is the custom on popular tourist treks in Peru. We negociated the 40soles to 10 ($3) and then I just invited him to hot chocolate instead. He told me to keep an eye of my shoes because people here steal hikers shoes. I told him i have the dog!!! In the morning it almost cleared up. Dog and me waited for a bit but no luck. 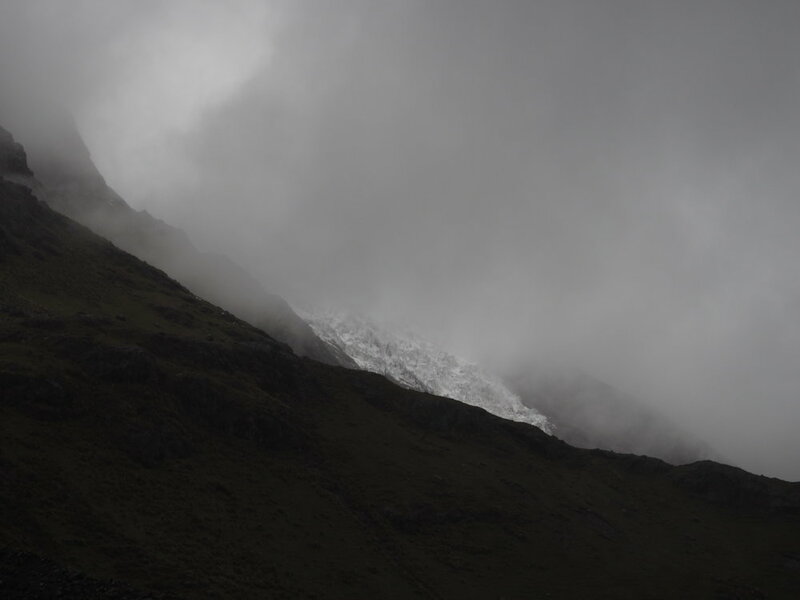 The fear of missing out was there, what if I never see the Nevado? But something has changed along the way, something like this would upset me before but no, not now. I was just passing by, riding, riding for the feeling. It didnt matter if it rained or snowed or hailed. Pooch was also riding for the feeling or for the food, who knows. I feed him well! We traversed an amazing, relatively flat and surely rideable ridge. Great views but the clouds did not let up. not sure which one is this one, not Ausangate. I rode hastily around some hotsprings and houses, fearing someone might come out with a notepad and receipts to collect a fee and pushed for a proper pass, as somebody had his bike stolen overnight here. Trail zoomed down ranging from improved trail to rideable to various states of mud and disrepair (still rideable on a fat bike). A lake viewpoint caught my attention, it would mean no frost on the tent in the morning and dog was all like "well... whats for dinner?" So i set up camp here. dog was good, no begging, no stealing (even when I wasnt looking) The fair and strict code of the mountain! We caught a little sunset but alas, it was all clouds. And then you wake up in the morning and this is what you see! No matter how many coffees or chocolates I could drink, the clouds didnt want to go away. The pass was cold and I was more excited to ride down. Which at times was rather steep and the corners a little too narrow to turn without putting a foot down. 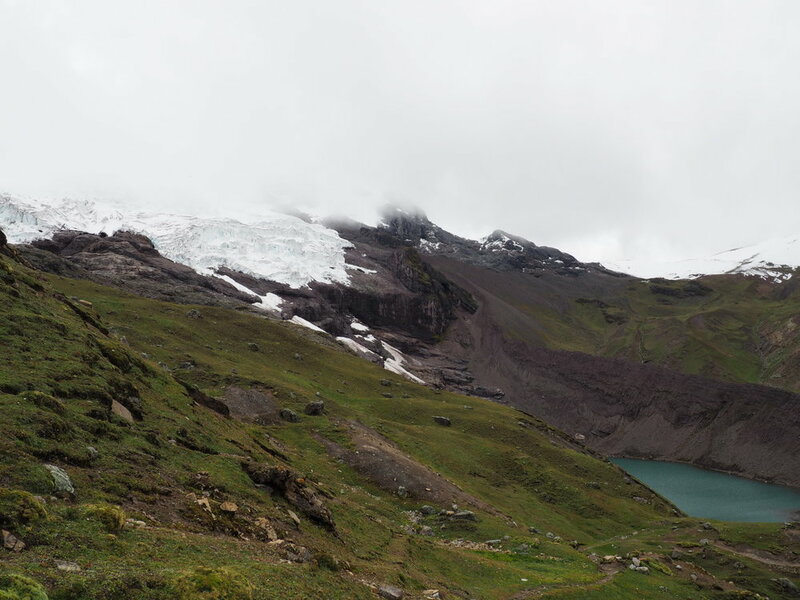 At a 4600m lake, a reminder that this remote trek is a donkey-mule-tourist bonanza in the summer. The ride down was smooth and eventually roaded. 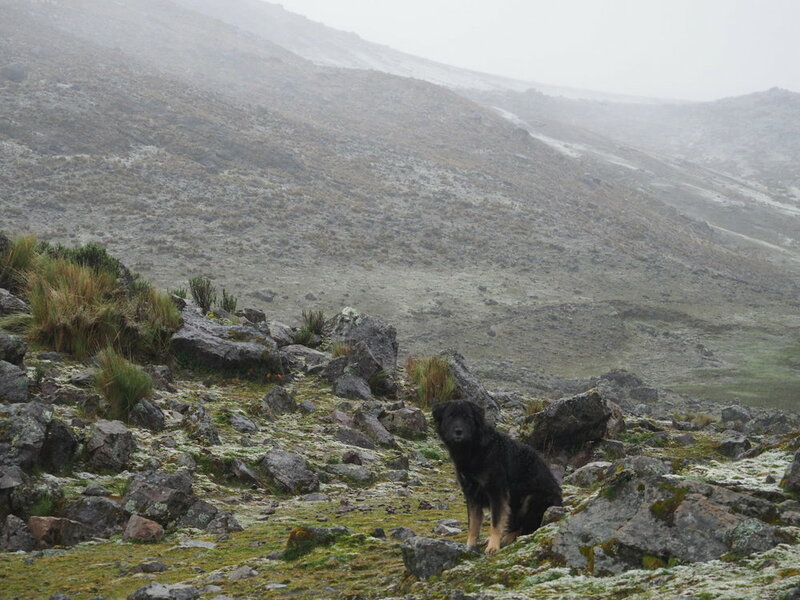 or maybe he was the legendary hero dog guide of the Ausangate circuit. 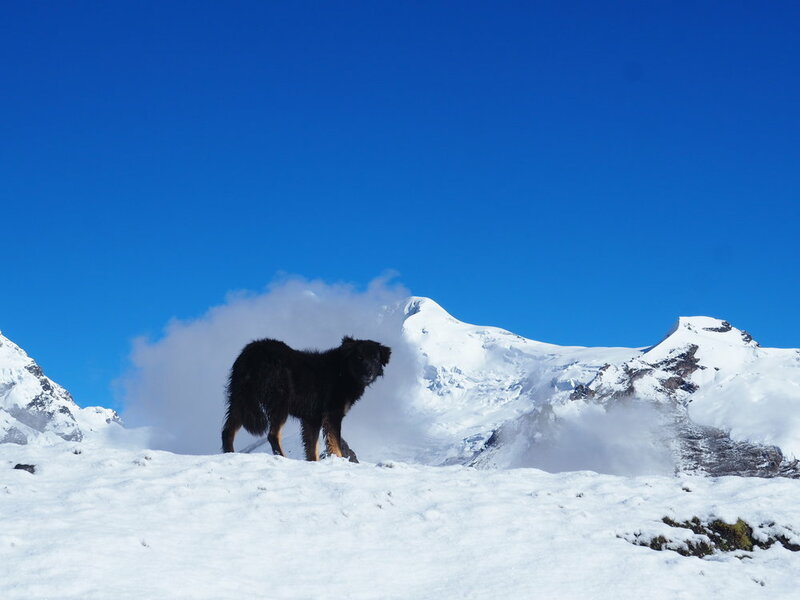 He who leads stray hikers across 5000 meter passes and roams some of the most beautiful mountains in the world. Maybe his life is here where he can be of help. You would hear about him in a distant hostel or on a journal somewhere across the world wide web. Or just the Shadow of Ausangate. Maybe ill be back one day to cut his nails and shampoo him. 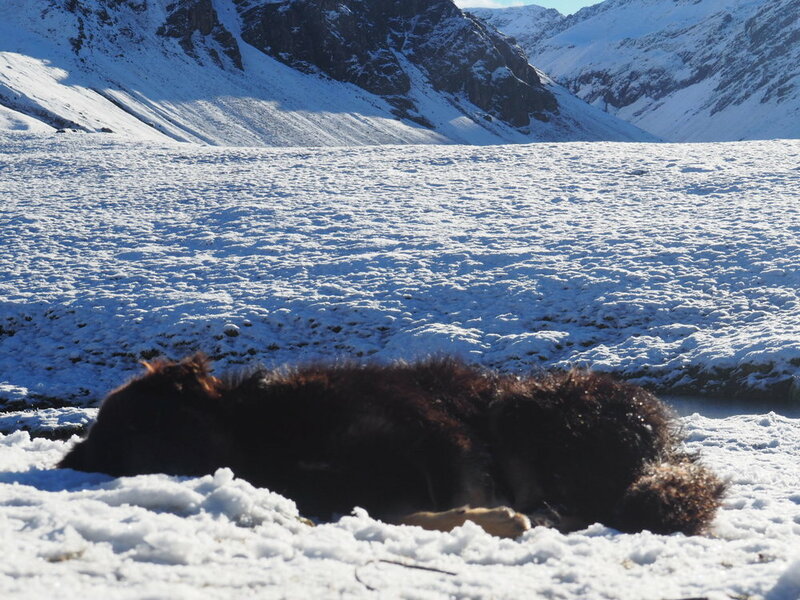 Laraos and its donkey mating lake was wonderful but I had to leave the bed and a roof behind in favor of a couple more high passes. The climb was gloomy and sometimes rainy. 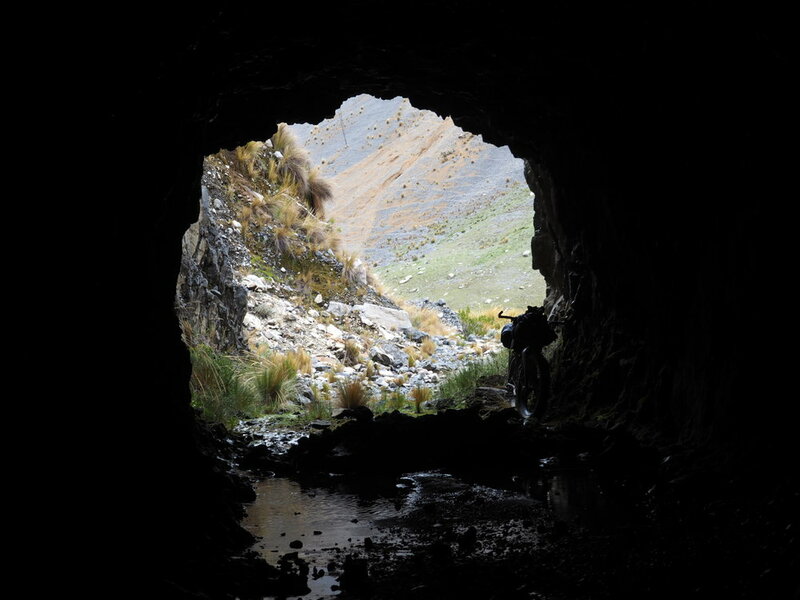 I wondered about venturing in one of the abandoned mines and while wondering about the safety of it, an ankle deep surprise section of mud made the decision for me! 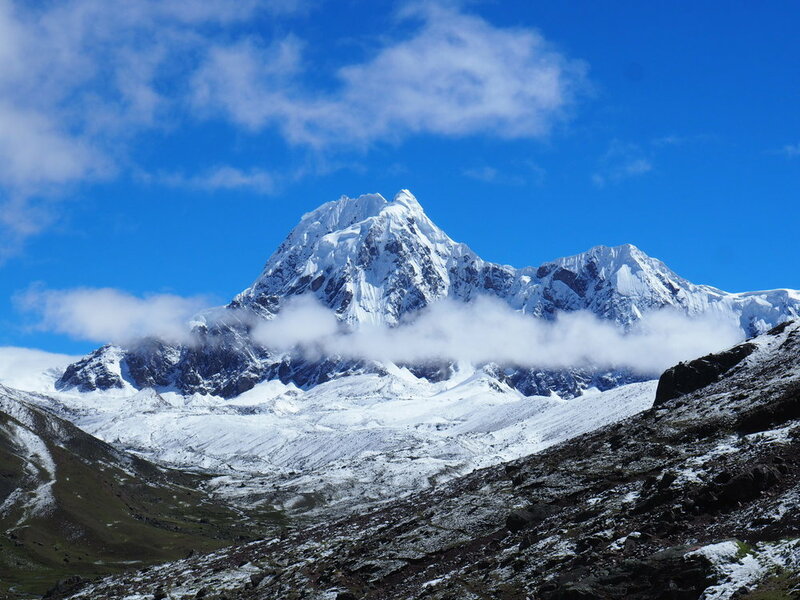 I wasn't too excited about sleeping near the pass so I settled for a 4500m roadside gem with decent views. It was one of these days where you look at the topo map, at the mountain ahead and wonder... "how???" Then you remember that its about the mines. Hearing the blasting from far away and feeling the tremors when nearby. A mining pickup pulled over and invited me for lunch and wifi! They even scooped another portion of decent miners food for dinner! Miners are friendly people and although i missed an odd looking mining excavator by bare minutes, i am sure they would have scooped me and the bike and carried me up the hill! a little mining poodle, maybe he can sniff out rare minerals!! lunch was actually up to Peruvian standards (although low on veggies), mining towns serve really bad food. and if you are wondering... yes! there was internet!!! 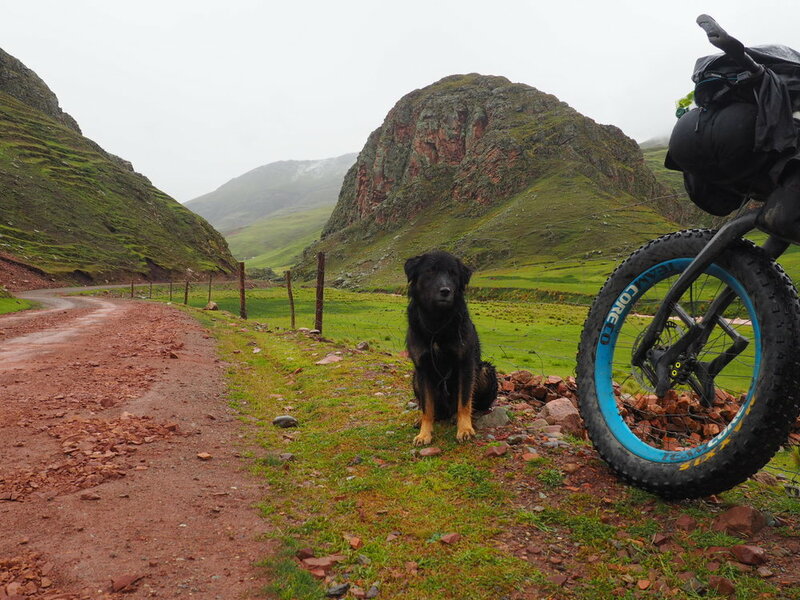 A grumpy pampa dog watched me as I took a break before the rain began. Huffing and puffing under the rain gear, the rest of the day was a cold and gloomy experience, easily forgotten the next time a little sun shines. Somehow I had thought the climbs would be less frequent and easier but not really. The air is thin, roads sometimes rough and it goes up and down like the bitcoin. 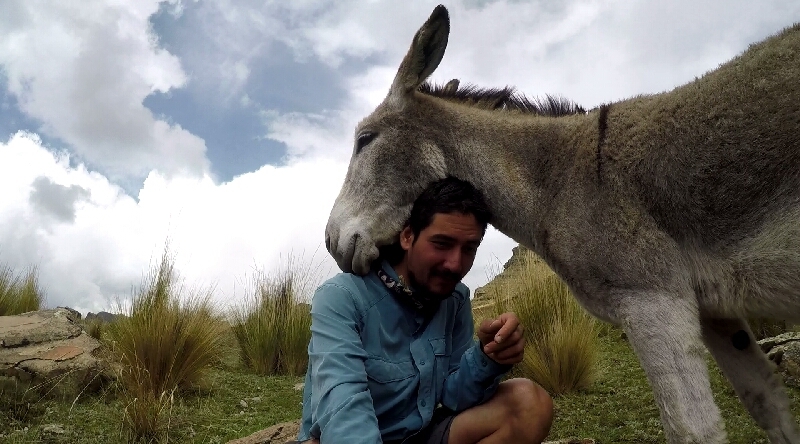 I had a disappointing lunch at a dirty mining town and went up again under the warm sun and under friendly lady burros. There was just something about the rocks and textures in the afternoon sun but a gust of wind can just take all the warmth away. i bet you there is some poor shepherd behind that mountain that will get hailed on! 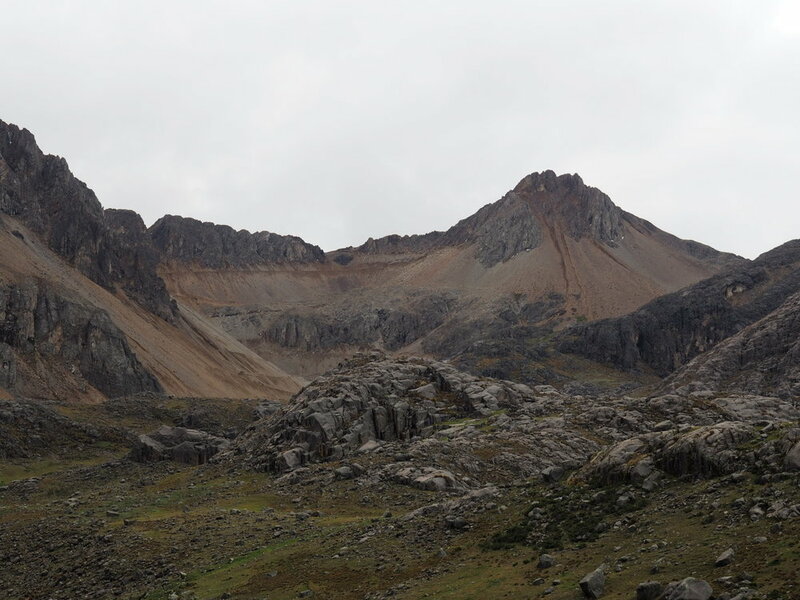 I hadnt intended to make it over this pass but going down to camp at 3500m was a good idea. A rock wall gave wind protection and cover from the nearby road. It rained as usual at night. 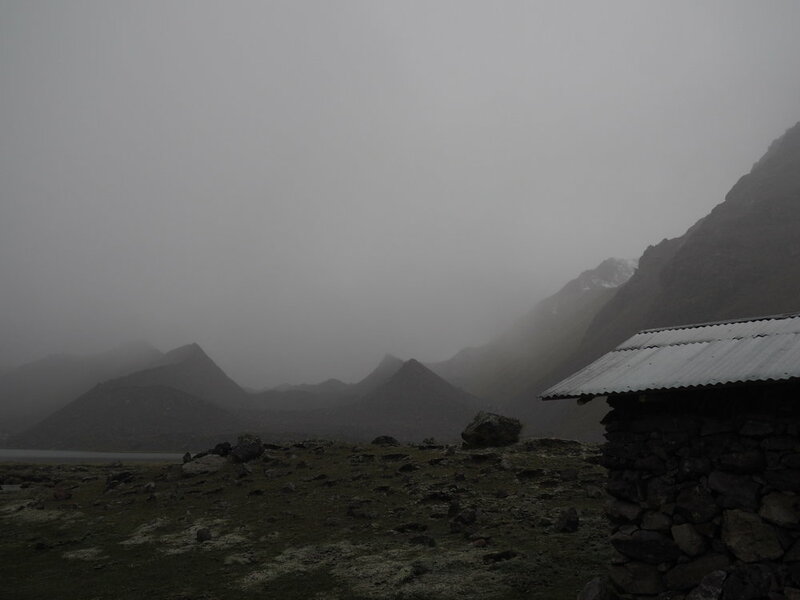 The morning promised a sunny day but it just rained all the way up to 4700m and waaay down to 3000m. I closely resembled the random wet dog that wanted to fistbump me at the pass. 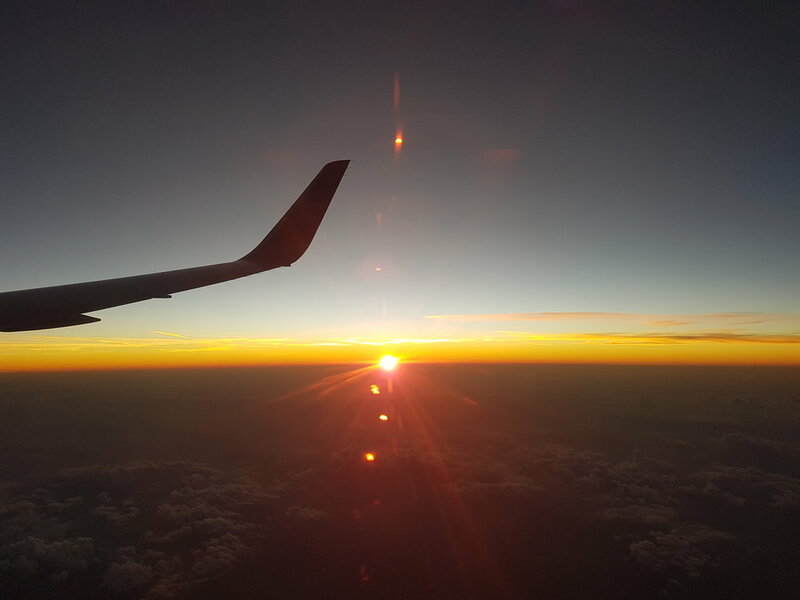 By now the impending visa time limit was rather a problem and I wasnt sure what to do. 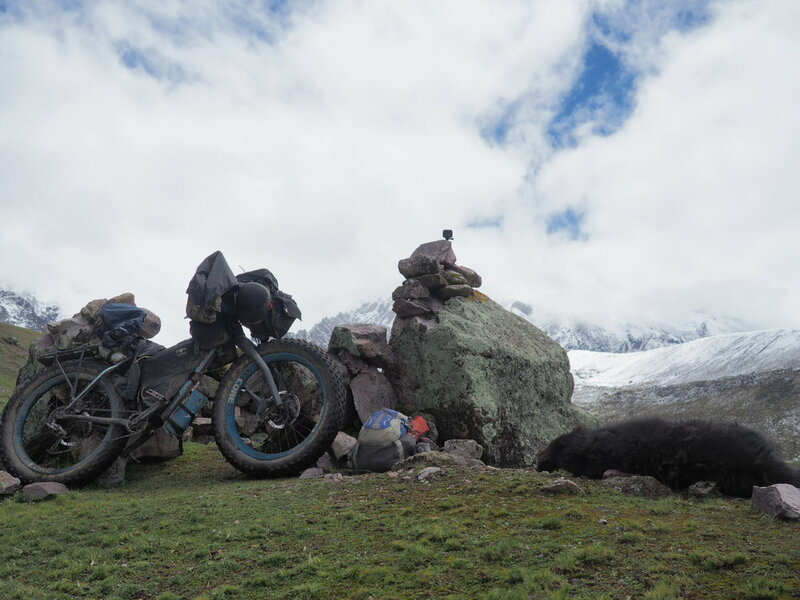 Consulting Scott Pauker's journal who rode from here to cusco, I did not find riding on main roads with similarly if not bigger climbs all that interesting and took a bus to near cusco, where I left the bike and went to reset my visa time.